Overview - When newcomer Lena Duchannes (Englert) arrives in the small town of Gatlin, she quickly captures the attention of Ethan Wate (Ehrenreich), who only wants to escape what he views as a boring and dead end town. He quickly gets more than he bargained for, though. Lena possesses strange powers that have long kept her at a distance from others in her life. Lena and Ethan are drawn together, but their budding romance is threatened by the dangers posed by Lena's existence as a "caster" and her family's Dark powers. More distressing, though, it's what's coming. Upon her sixteenth birthday, Lena must undergo the Claiming, a process that will decide her fate forever: Light or Dark. With the massive success of the 'Twilight' franchise, Hollywood has quickly latched onto a new subgenre: teen paranormal romance. Eager to milk the concept for all its worth, numerous studios have tried to repeat the same formula with different supernatural creatures. From vampires to aliens to zombies to ghosts to werewolves to... well, even more vampires, these efforts have all had varying degrees of success and failure. 'Beautiful Creatures' aims to once again emulate this same basic idea, but this time, with spell-casters! While that might sound incredibly groan-inducing, thanks to a talented cast and some decent writing, the movie is actually a little bit more than your usual otherworldly love-story schlock. Flawed but still fairly enjoyable, it's a contemporary Southern Gothic romance filled with oscillating bits of cheesy melodrama, cluttered mythology, and genuine charm. Based on the novel of the same name, the film follows Ethan Wate (Alden Ehrenreich), an intelligent high school student who one day hopes to leave his small town of Gatlin, South Carolina behind. When the mysterious Lena Duchaness (Alice Englert) enrolls in his English class, Ethan is immediately intrigued. Lena is clearly different from all the other girls, but as the two get to know each other more, the smitten young man starts to discover just how unique she really is. Gifted with supernatural powers, Lena is part of a secret race of sorcerers known as "casters," and when her sixteenth birthday arrives she will be claimed by either the light or dark side of magic. With various forces working to push her toward good or evil, will Lena and Ethan's burgeoning love be enough to save her from the approaching shadows? Right off the bat, the movie tries to differentiate itself from typical 'Twilight' clones by establishing a male perspective. Though later portions of the film shift more heavily toward Lena, our initial introduction to this world is from Ethan's point of view. This simple reversal, with the boy being the normal human and the girl being the super-powered character, works surprisingly well. Granted, it's far from a mind-blowing twist on the usual formula, but the new viewpoint is more than a lazy gimmick and does inject some decent life into the proceedings. As a character, Ethan is fairly engaging and the writers do a nice job of setting up his typical "stuck in a small town but dreaming of something better" attitude. Like many similar protagonists, he's an avid reader who uses literature as a means to escape from his boring existence, and while repeated references to the works of Vonnegut, Salinger, and Bukowski reek of the filmmakers trying a little too hard to earn credibility, these various influences help to create a legitimately likeable hero. Relative newcomer, Alden Ehrenreich, lends the role a relatable everyman appeal, and though he fits firmly within his standard archetype, there is some solid personality in both the writing and the acting. As the supernatural object of his affection, Lena Duchannes, actress Alice Englert (daughter of director Jane Campion) is also very strong, bringing just the right amount of sarcastic teen angst, brooding strength, and sympathetic vulnerability to her otherworldly character. Despite playing a powerful enchantress caught between light and dark, Englert never loses sight of Lena's human heart, helping to ground the young woman amidst all the movie's escalating supernatural happenings. In fact, the core romance that develops between the two love-struck outsiders ends up being one of the strongest aspects of the film. Unlike the dour, lifeless melodrama of Edward and Bella, their coupling actually has a pulse. Sweet and entertaining, there is a welcome spark of warmth and humor to their interactions, and the two performers share believable chemistry. Sadly, once the script starts moving away from their teen courtship toward the story's grander supernatural drama, things start to get problematic. As presented, the whole caster mythology is very convoluted and underdeveloped, and certain aspects don't make much sense. For instance, the casters are supposed to be a secret group who are trying not to draw attention to themselves, and yet they often dress like they just walked out of a Lady Gaga video. Dark curses and Civil War era flashbacks are all thrown on top of the already busy "good versus evil" plot, and none of these elements are particularly interesting. There's some potential in the internal struggle between light and dark, but outside of glowing eyes and swirling clouds, the filmmakers don't do much with the concept. Periodic stretches of expository dialogue try to fill us in on the important bullet points and rules of being a caster, but one gets the feeling that many details are being skimmed over. Even worse, the elements that are addressed are rather muddled and clunky. It remains unclear what exact powers these casters really have, and while it's implied that different characters have different gifts it's sometimes hard to really get a sense of their individual talents. On the plus side, the magic aspects of the story do lead to some decent fish-out-of water comedy that shows Ethan clearly at odds with the incredible predicaments he finds himself in, and the movie as a whole has a nice sense of humor about itself. Unfortunately, this diminishes as the runtime goes on, and eventually the story is taken over by formulaic, histrionic conflicts that go in circles and ho-hum set pieces. These various demonstrations of the characters' powers are all pretty lame, revealing a distinct lack of creativity. For example, one of the special effects highlights that's supposed to show off the casters' incredible abilities is a scene featuring a... spinning table. Yes, a spinning table. To its credit, the sequence is kind of fun, but more originality could have been used to help make the casters' world seem unique and exciting. As it stands, despite their silly costumes and colorful hair, they're kind of mundane. Thankfully, the supporting cast does a nice job of elevating their underwritten roles. Jeremy Irons and Viola Davis bring some class to the proceedings, and Emma Thompson chews up the scenery nicely as the story's villain. The sultry Emmy Rossum (who continues to do fantastic, under-appreciated work on Showtime's 'Shameless') is also notable as Lena's devious cousin, though, like the rest of the ensemble, her character isn't as fleshed out as she needs to be. Even more underutilized are Eileen Atkins, Margo Martindale, and Kyle Gallner who barely have a chance to even register on screen. The film is based on the first of a series of books, so its likely that these characters would have all been developed more in any potential sequels –- but based on the lackluster box office of this first outing, that's unlikely to ever happen. I never thought I'd say this about any teen paranormal romance, but the basic love story here is actually the film's most appealing aspect –- that is, before it eventually devolves into standard melodrama. There is some decent potential within the whole good versus evil story that rests at the core of the script, but the execution of the film's supernatural aspects is disappointingly clumsy and trite. The cast is solid, however, especially the two young leads, bringing a little more enjoyment and personality to an otherwise familiar story. While 'Beautiful Creatures' is a marked step up from sparkling vampires, the movie fails to fully take its increasingly lazy genre to new heights. 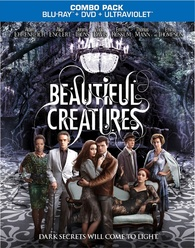 Warner Bros. presents 'Beautiful Creatures' in a Blu-ray/DVD/UltraViolet Combo Pack. A BD-50 disc comes housed in a keepcase with a cardboard slipcover. A separate DVD disc and instructions for a downloadable UltraViolet digital copy are also included in the package. After some skippable trailers, the screen transitions to a standard menu. The movie is provided with a 1080p/AVC MPEG-4 transfer in the 2.40:1 aspect ratio. Certain scenes are more striking than others, but the overall picture is pleasing, effectively bringing the Southern Gothic style to life. As one might expect from a brand new release, the source print is in prefect shape. A light layer of grain is visible throughout, but its appearance and consistency does waver slightly. Clarity is good, offering a pleasing sense of dimension in brighter scenes, and the fantastical production designs and elaborate costumes all come through with a nice sense of fine detail and texture. With that said, the image is never exactly razor sharp and a certain softness does pervade darker sequences. Colors are well saturated with daytime shots veering toward a warmer palette, and nighttime scenes featuring cooler shades. Fleshtones seem to be in line with the chosen aesthetic but there are times when some faces have a faintly orange tinge to them (particularly Jeremy Irons). Contrast is solid with well balanced whites, but shadow detail can be a little murky in dark scenes and sometimes carries a blueish tint. 'Beautiful Creatures' doesn't quite "wow" in the same way that some similar contemporary efforts do, but the transfer is technically proficient and offers a few impressive moments here and there. The film is presented with an English DTS-HD MA 5.1 track, a French Dolby Digital 5.1 track and a Spanish Dolby Digital 5.1 track, along with optional English SDH, French and Spanish subtitles. While there are a few surprisingly quiet stretches, the mix perks up when it needs to, highlighting all the supernatural set pieces with enveloping sound design. Dialogue is full and clear throughout with no balance issues to report. A generic sense of light ambiance (crickets, birds, falling rain, etc.) adds a decent sense of space to the proceedings when called for, but several stretches become fairly frontloaded, lacking that extra sense of texture and dimension that elevates the best mixes. With that said, surrounds do come into play at key moments, sending creepy whispers and supernatural effects all around the room. Standard directionality is also well implemented, offering smooth imaging between speakers as characters and objects move about the soundstage. The table tornado scene is especially immersive, capturing the audience within the spinning cyclone. Likewise, a climactic storm has some standout audio work with powerful, deep bass. Several spooky low frequency cues are tied to the score as well, and dynamic range remains wide and crisp. The track isn't as engrossing as it could be as a whole, but the film's more aggressive moments bring a welcome kick that work very well with the images on screen. Warner Bros, has put together a decent but mostly superficial collection of supplements, including deleted scenes and some Blu-ray exclusive featurettes. All of the special features are presented in 1080p with Dolby Digital 2.0 audio and the same subtitle options as the main film. Deleted Scenes (HD, 8 min) – Four deleted scenes are viewable separately. These are all mostly inconsequential additions, but we do get a little bit more of Rossum's character, including a quick lingerie scene. How the hell did that end up on the cutting room floor? "Icons" Trailer (HD) – A trailer for author Margaret Stohl's latest book series "Icons" is included. Yes, 'Beautiful Creatures' is yet another 'Twilight' inspired supernatural teen romance, but it has a few sparks of personality and heart. Sadly, that can't quite make up for the script's muddled mythology and very generic second half. While there are some minor inconsistencies, the video and audio presentations are both good with no major technical concerns. Unfortunately, most of the supplements are merely redundant and fluffy promo pieces. Despite suffering from many of the same pitfalls as other lesser efforts in its genre, I must admit, I actually kind of enjoyed the film. Fans of similar efforts will definitely want to give this a look, and even those tired of paranormal love stories might want to give it a shot.